I’m really excited about the potential of Blockchain Financial Markets to deliver real value to people, their families and their communities. For me, this is the magic of finance (refer Blog №1). I’m also aware that we need to approach this in the right way or we may inadvertently cause harm or impose additional costs on society. For me, when we set out to build Blockchain Financial Markets ‘responsibly’ it means that we need to proceed in a way so that Blockchain Financial Markets proactively prevent the proceeds of crime and the financing of terrorism from being part of the ecosystem. I can almost hear you saying that this is quite a narrow definition of ‘responsibility’! And indeed, it is. But, don’t worry, in Blog # 4 in this series I will revisit a broader and potentially more personalized definition of responsibility that blockchain financial markets may be able to help you action. Your personal ethics, whilst important, are not a shared ecosystem wide goal. The common responsibility goal at the core of Blockchain Financial Markets is to have a pro-active approach to Know Your Client/Anti Money Laundering (KYC/AML). In other words, this isn’t something that we at Chain Financial believe you should be able to ‘opt out’ of. If you are the Financier for your local crime syndicate, I’m afraid you are going to have to go elsewhere. Sorry, not sorry. How Do Traditional Financial Markets Approach KYC/AML? A good place to start is how Traditional Financial Markets around the world go about tackling KYC/AML. If you will forgive an over simplification — the following diagram sets out the current Traditional Financial Markets approach to KYC/AML. Please note I have not included suspicious activity reporting methods and a few other key features. The key observation is that Banks and other Traditional Financial Market Institutions play a central role in tackling KYC/AML currently. Police, and other Regulatory Entities, rely upon Banks to access critical transaction data. Government and Regulators rely upon Banks to bring the rules to life in their operational procedures. What Would Happen If Blockchain Financial Markets Didn’t Pro-actively Tackle KYC/AML? We can consider the counterfactual by looking at the pain points of the Dotcoin Bubble of 2017/18. 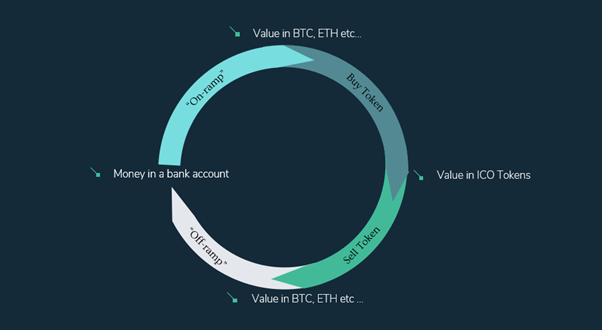 The diagram below sets out a simplified version of the value flows during the Dotcoin Bubble. When people accessed an “on-ramp” into cryptocurrencies they were actually moving value from their fiat bank accounts to a digital wallet holding in the form of say bitcoin (BTC) or Ethereum (ETH). As such, the Bank, and indirectly the Police, lost ‘visibility’ of subsequent value movements. Initially some cheered, but later cried, when they tried to use an off-ramp to come back into Traditional Financial Markets. In practice, re-entry into the Traditional Financial Markets system was hard because the Banks were doing their job. They asked: Who are you? What are your activities? Where has this value come from? How can you prove that it is not or is not partially the proceeds of crime? All reasonable questions that they were required to ask. After the dust had settled it was clear that the crypto ‘on-ramp’ was at the same time an ‘off-ramp’ from Traditional Financial Market KYC/AML compliance. I have sympathy with the fact that not all value in cryptocurrency is the proceeds of crime — certainly the value I have put into it did not come from criminal sources. But, without there being a central party in the cryptocurrency world as a port of call for the Police to interface with, it becomes very difficult to sort the criminal proceeds from the legitimate funds. At Chain Financial, we think Blockchain Financial Markets need to learn from this experience and that Identity and Transaction Record Custodians (hereafter ‘Identity Custodians’) need to be hard wired into the core of the Blockchain Financial Markets system. As such, we are building the Identity Custodian role as a core element in the fabric of our blockchain technology. Everyone who wants to hold Blockchain Financial Products will in practice first be required to select an Identity Custodian. The Identity Custodian is not an identity solution, like SingleSource, but merely a Trusted Intermediary with read-only access to our identities and transaction history. Identity Custodians are likely to be Traditional Financial Market Institutions but they could also be Emerging Entities with brands of trust. Analogous to existing Traditional Financial Markets, the Identity Custodian will take the role of the Trusted Institution that keeps the information private until it provides it to Police pursuant to a valid warrant. Chain Financial is writing a robust standard, that exceeds the legal minimum, for what identity and transaction information needs to be available for the Identity Custodian to access based on the risk of the Individual and their transactions. This standard will directly control the possible flow of the assets in the Blockchain Financial Products built on top of our blockchain technology. As already existing cryptocurrency assets, such as BTC, were not built on top of our blockchain technology, they will not be able to form part of our Blockchain Financial Market. Indeed, it is worth noting that our approach does not ‘clean up’ value that has already been moved into cryptocurrency assets, nor are there any cryptocurrency denominated assets in our system. There are three key challenges for us to face together as we move forward to build programmable money with identity at its core. Setting a High Standard. We need to set the identity and transaction information standards very high. What the legal minimum is, may not be the right focus. If we do KYC/AML right it will be a shared asset that the entire Blockchain Financial Market ecosystem can use as a foundation. Chain Financial is drafting a standard and canvassing opinion with leading Banks and Regulators to strengthen it. We will be leveraging the technological capabilities of leading identity solutions, such as SingleSource, and appropriately using biometric verification and geo-location cross-referencing. The standard must be set high. Do it once and do it right. Collaboration. Our solutionis a practical middle ground that integrates blockchain technology with the current operation practices of Regulators and Police Authorities. To be successful, Trusted Intermediaries in our Traditional Financial Markets system will need to put their hand-up to be Identity Custodians. At Chain Financial we will build the tools and technology to enable them to do their job — but we still need them to independently and professional execute on the Identity Custodian role that they have been trusted to do. Blog #3 in this series drills into more detail about the Identity Custodian role and other roles that Trusted Intermediaries can take as they collaborate in building the emerging landscape of Blockchain Financial Markets. Privacy Protection. Whilst identity needs to be a core feature of Blockchain Financial Markets we want to at the same time protect transactional privacy. Chain Financial’s technical challenge is to enable you and your Identity Custodian to see your Blockchain Financial Market transactions whilst at the same time keeping all your details private to everyone else. At Chain Financial we welcome your collaboration in building Blockchain Financial Markets. Working together we can enable more people to better themselves, their families and their communities. Get in touch with us and contribute your ideas and effort to magnifying the magic of finance. Dave Corbett is the CEO and Co-Founder of Chain Financial. 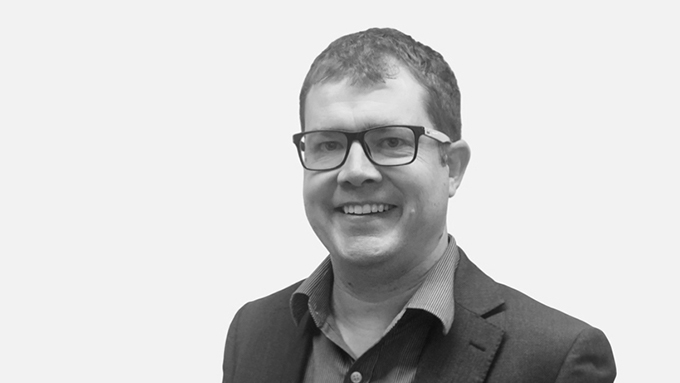 Immediately prior to founding Chain Financial Dave Corbett was a banking & capital markets Partner at PwC for more than nine years based in London and Auckland. Dave has nearly two decades of professional consulting experience servicing clients in key markets globally. He is an expert in financial instruments, capital markets, financial engineering and innovation. Chain Financial is a global company based in New Zealand focused on enabling growth in Blockchain Financial Markets. Chain Financial is both building the technology to enable Blockchain Financial Markets and also collaborating with traditional and emerging entities around strategic opportunities in the emerging landscape. The founders of Chain Financial are Dave Corbett, Centrality and Intranel. Centrality is a New Zealand based blockchain technology company that is a global leader in UNthinking the digital landscape for a decentralised world. Centrality specialise in providing developers and businesses with the tools to create blockchain-based products and services. Aaron McDonald, Centrality’s CEO, is the 2018 EY Technology and Emerging Industries Entrepreneur of the Year. Intranel is a New Zealand based emerging technology consulting and engineering business. Their business and development teams are experienced at accelerating technology delivery. They have completed significant assignments delivering technical growth, operations management and regulatory compliance for blockchain financial market entities. Dave Corbett Dave is the CEO of Chain Financial. Chain Financial is an innovative technology company focused on growing blockchain financial markets.